The pretty little towns of Murano and Burano are two of the many islands in the Venetian Lagoon. Both of which are easily accessed by 45 minutes to an hours’ boat ride from the city centre and make a wonderful day trip from Venice. Murano has become famous for glass. The skilled craftsmen create beautiful vases and other items through glass-blowing. Much of which is then exported around the world. 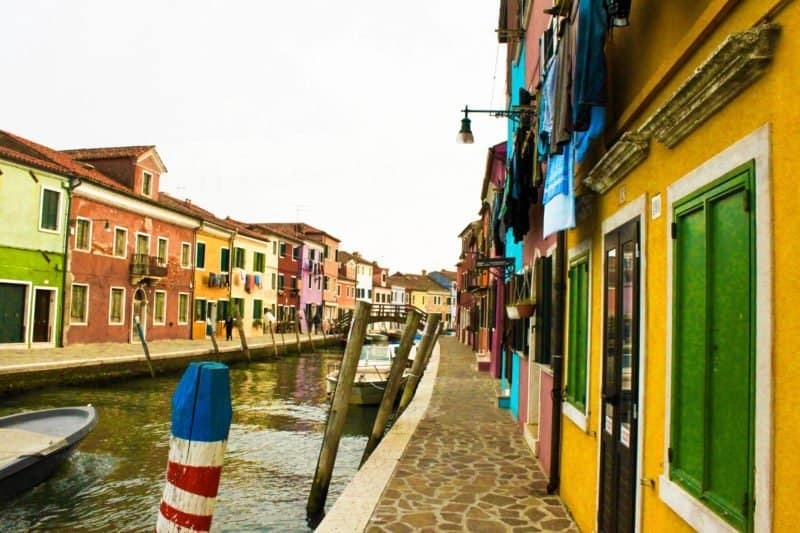 Burano is famous for lace and the brightly coloured homes that line its waterways. Both islands make a lovely day trip outside of Venice. I would even argue that the food is better out here too. To best illustrate this great day trip from Venice, I’ve put together a little photo diary. Enjoy the colourful inspiration! Have you been to Venice? Let me know in the comments below! If not, I hope this has been helpful if you’re planning on heading to Venice in the coming months, or inspiring if you didn’t already have plans! It looks like an amazing trip! I visited Venice about two years ago, so I wish I read this article sooner 🙂 But I’m sure I will go back again one day, and have another chance. Great pictures I must say! I actually never heard about Murano and Burano but they both looks stunning! Although if I would have to choose one it would be Burano! I love those colourful houses! It looks so magical and wonderful! I would love to go back to Italy! Its such a beautiful country and obviously it has delicious food! Great photos! When I was in Venice I met a couple who told me about these 2 islands. Luckily I got to visit and wow was it so worth it! Spectacular color and such a great area to be in! I had the best pasta here at a roadside cafe and the best pics! Your pixs are fabulous by the way! Thanks for bringing me back to good memories! Such beautiful towns! I’ve not been to Venice yet but desperate to go! Love adventuring outside the main city as well and these look awesome! No way!!! Great, you defo gotta go next time! Venice is definitely high on my list for upcoming years. It is such an iconic place that despite the crowds I must see it. Beautiful photos! I love all the colourful buildings. Yes, it really is! A bit of a life bucket list place 🙂 Hope you go soon! This is just what the Dr. ordered. I’m planning a summer trip with the family to Rome and have definitely added Venice for a one day trip. This will help me to put together things for the day. Your photos are also lovely, so making up my mind where to go will be difficult. Ah awesome, yes definitely! If you have early/late enough trains, you might be able to both! Have a great time! Murano and Burano look so cool. I love those colorful houses. Hope that I can visit it one day.